SWADESH Deepak began his literary journey as a writer of short fiction and then he moved onto novels, but real glory stood awaiting him in his next avtar as a playwright. This playwright of Court Martial fame was presented the Sangeet Natak Akademi Award on the May 13 this year for his overall contribution to Hindi theatre. While Swadesh’s fiction, which probed deeply the complexities of human mind, had brought him serious notice, his plays brought him a wide audience, fanfare and fame all over the country. 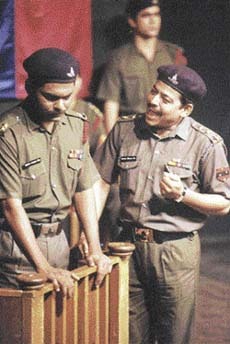 The play Court Martial, written a decade and a half ago was the turning point in his career. The play set many records. It was translated into 12 Indian languages, including English, and has run into 2000 shows. Among the directors who have staged this play are Ranjit Kapur, Usha Ganguly, Arvind Gaur, Amla Roy and Kewal Dhaliwal. Many plays were to follow and also the price that the human mind must pay for delving too deeply and too intensely into its recesses. A long spell of illness followed in which Swadesh enacted his own Kafkaesque trial in and outside the psychiatry wards. And then he rose again phoenix-like to complete the unfinished scripts. One always cherishes meeting Swadesh in his home in an old colonial bungalow in Ambala Cantt and what endears him to the heart is the fact that he is constantly surprised at the outcome of his own writings, the working of his own mind, the latest crush he may have on some obscure woman or vice versa. Grandpa Swadesh, for that is what he is now, has the childlike innocence that is so much in contrast to the dark and painful images and thoughts that his writing evokes. The latest surprise is the award. "Well it has happened, although I don’t know how. The fame came many years ago. But I am glad that I have been able to break the citadel of Hindi writing: a tough thing for a Punjabi-speaking writer," he says. And it’s true for the only other example we have before us of a writer hailing from Punjab bewitching the Hindiwalas thus is of late Mohan Rakesh of the Adhe Adhure fame. Deepak has penned eight collections of short stories, two novels and four more plays including Debashishu, Jalta Hua Rath, Sabse Udas Kavita and Kaal Kothri. He is a recipient of several other awards for his writings including the Soordas Samman from Haryana and the Punjab Languages department award. The seven long years of depression that he suffered found their way into startling memoirs called Maine Mandu Nahi Dekha. What is most interesting is to know how Deepak made his transition from fiction to play writing? It is worthy to note that his emergence as a playwright came at a time when Hindi drama was starved for original plays. Mohan Rakesh was long gone; Surendra Verma’s best had been written and done with. At this time either it was adaptation of plays from other languages or Hindi fiction. Looking back Swadesh says, "I did not attend any workshop or do a course in play writing as is the fad these days. Those days Milkhi Ram Dhiman was doing theatre in Ambala. I would be present at the readings and the rehearsals. There would be long discussions with people like Baba Lali participating in them. So a silent manthan or churning was going on in my mind. And then one day I sat down and wrote a play. His first play was Debashishu and second was the all time great Court Martial. Others followed but now we wait for the next because there can be no sitting on laurels for our very creative and original Swadesh for whom the play has proved to be the thing."